Teach Your Dog These 3 Easy Tricks in 15 Minutes – ComeHereBoy! Teaching a dog tricks is one of the more enjoyable aspects of having a dog. Even old dogs can learn tricks, despite the old adage. The nice thing about teaching tricks is that it can help break up the monotony of regular obedience training, or it can just be something to help keep your active dog busy. When you teach dog tricks, your dog often learns much faster than when you are doing the boring old sit and down – mostly because of your attitude about what you’re teaching. Examine the way you teach your dog tricks and you may find the secret to making your dog excited and more accurate at performing any behavior. 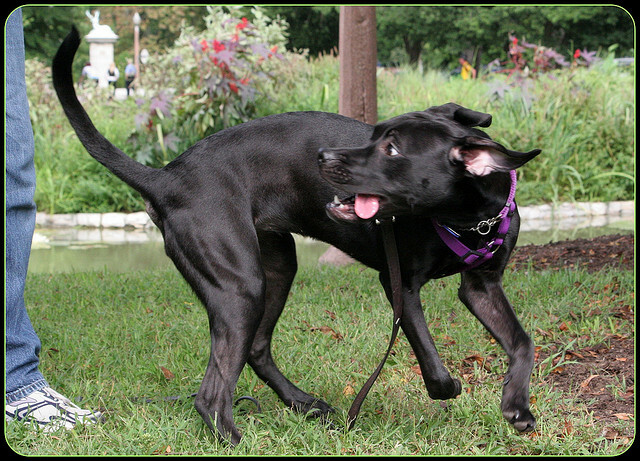 Some dog tricks can be taught by merely catching the dog in the act of doing something naturally, such as when your dog does a stretch bow when coming out of his kennel. Simply labeling that behavior “take a bow” can make a “trick” come into being without any effort on your part. 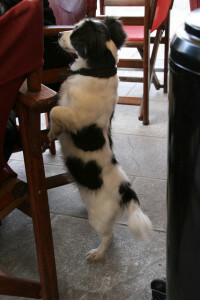 Other dog tricks require some time and the use of shaping. And then we come to the dog tricks I’ll teach you today that require active baiting, but can be taught (to the point that you can use a hand signal to trigger them) in fifteen minutes. 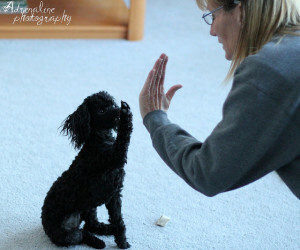 The twirl or spin move is fun and easy for your dog to learn. It actually can have practical use too! Especially during winter when it’s wet outside. You can have your dog do some spins on the carpet as a way to clean their paws. Gather your training tools – treats, clicker, toy… whatever it is that motivates your dog. Now to teach this move, you merely have to bait your dog with the treat or toy by holding it close to their nose and slowly moving it toward their tail, as they follow it with their nose. If at first they are reluctant, click/reward any movement of the head in the direction you’re leading them. Make sure when you’re beginning, you only do one direction. Eventually your dog will start to follow the bait and you can begin to lead them in a full circle before rewarding. Give the behavior a name as they begin to do the full circle. Once they get the hang of OK nice circle, have them do two and tell them “stop” when you’re done and ready to reward. As you practice, you can stop baiting and start having them follow your empty hand. By the end of the fifteen minutes, your dog should be responding to a small movement of your finger in the direction of movement. If you want to get fancy, you can teach them a different word for each direction of spinning. “Spin” may be for a clockwise turn and “twirl” counterclockwise. 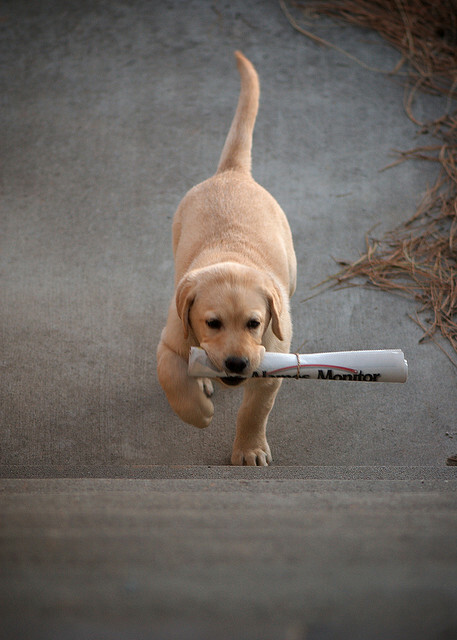 If you continue working it, you’ll have a dog that will switch directions mid – spin on command. Dogs love this trick because they get to run around and you’re usually really involved with them, rewarding with a lot of petting, treats and animation. Soon, they get to the point where it becomes a self-rewarding behavior. This one can be a bit tough, especially for larger dogs. 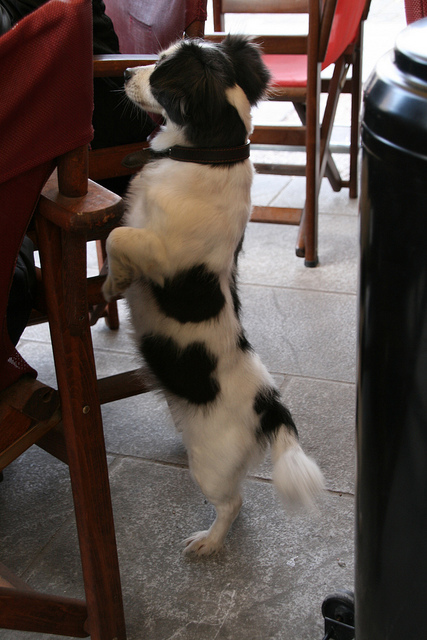 Begin by putting your dog in a sit with their back up against a wall (the wall is so they are braced for balancing, because we want to teach the behavior and then add balancing later so you don’t have too many variables.) Hold your bait up to their nose and ever – so – slowly bring it back over their head and bring it up until your dog pushes off the ground with their front feet. If your dog stops short of bringing their feet up, reward them several times at the point where they are straining their head and body up. After being rewarded at that point a few times, if you hold off on the treat and make them really reach and keep bringing the treat up, they will eventually jump their front feet off the ground to reach the treat. Reward this, name it and continue expecting them to hold their front paws off the ground for longer and longer bits of time. If you keep practicing, you’ll be able to barely flick your finger up and give the name of the behavior before they sit up on their back paws. After they have gotten good at it balanced against a wall, you can start doing it out on the open floor, though you might have to somewhat start over again, they will pick it up quickly once they figure out how to balance without a brace. Simple enough, you hold a treat in your closed fist about chest height on your dog. He’ll nose and bite at it and most likely, he’ll lift a paw and scratch at it (if they dont, lower your hand a bit til they do.) Click, reward and give it a name. After a few repetitions, he’ll offer the behavior without you having a treat in your hand. Keep rewarding, and after a little longer, you can give the name of the behavior and he should offer the behavior on command. So easy! There you go! Spend fifteen minutes teaching your dog these tricks and he’ll soon be on his way to being a dog star! What’s the best trick your dog knows? Comment below! I always like to hear of especially inventive ones.